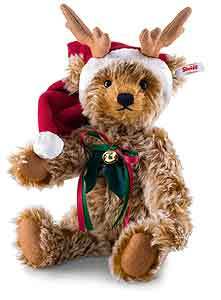 Reindeer Teddy Bear by Steiff. This beautiful hand made piece, in caramel tipped mohair, wearing the famous gold plated Button in Ear. Ashby Bears proudly presents REINDEER TEDDY BEAR. The reindeer Teddy bear made from curly, caramel coloured, spiky Mohair comes directly from the magical winter forest. Its long and crimson pointed hat with a wide trim and a white bobble made from shimmering fabrique is in typical Christmas style. The reindeer’s antlers made from wool felt, decorated with airbrushed silver tips, have been sewn on to indicate his Northern heritage. Red and green satin ribbons, green holly leaves of felt and a golden bell make the Bear an ideal Christmas present.